At iSpring, we look beyond technology to make high quality drinking water accessible for all households. We provide our customers with professional water solutions to any water concerns they may have. Tested by independent third-party to meet NSF/ANSI Standard: 177 for shower filters. Why Do I Need A Shower Filter? Unfiltered shower water can contain an array of chemicals like chlorine, bacteria and fungus from the shower head. The skin is the largest organ and we may absorb more chlorine through showering than through drinking water. Chemicals in shower water may cause skin irritation and other health problems. iSpring’s unique combination of KDF, Actived Carbon and Calcium Sulfite effectively removes chlorine, heavy minerals, bacteria, pesticides, and inhibits the growth of scale, algae, mold, and fungi, giving you healthier skin and stronger hair. This 3-stage filter system is designed for easy installation, low maintenance, and features dual carbon block filters along with a high-capacity sediment filter. 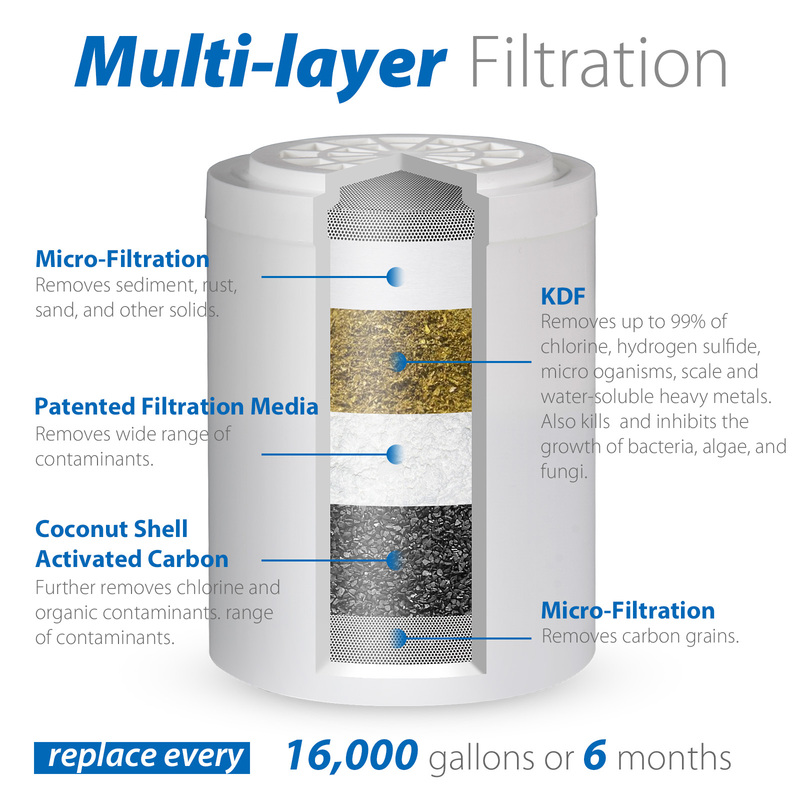 The sediment filter protects and extends the life of your system, while the carbon block filters work to remove many harmful contaminants like chloramine, chlorine, organic chemicals (VOCs), hydrogen sulfide, heavy metals, giardia, cryptosporidium, providing you with bottled quality water on demand. - Smoother skin and stronger hair. Chlorine free water protects the tender skins of young children and babies. Our long lasting high capacity filter cartridge contains more filtration media compared to other shower filters, and lasts up to 16000 gallons of water or 800 ten minute showers. We offer technical phone support Monday thru Friday between the hours of 8:30am to 5:30pm Eastern time. Contact our support team for personal assistance in selecting the right system for your water filtration needs. Now, and years from now, we will be right here and ready to help. iSpring 5-stage Shower Filter generates clean water from tap water. The unit removes a variety of contaminants including chlorine, bacteria, arsenic, heavy metals (lead, mercury, cadmium), hydrogen sulfide, THMs, MTBEs, VOCs, Chloramine, sodium, nitrate, microorganisms and scale, protecting your hair, skin and over all health. It also reduces limescale, mold and fungi in showers. It also balances pH of the water. 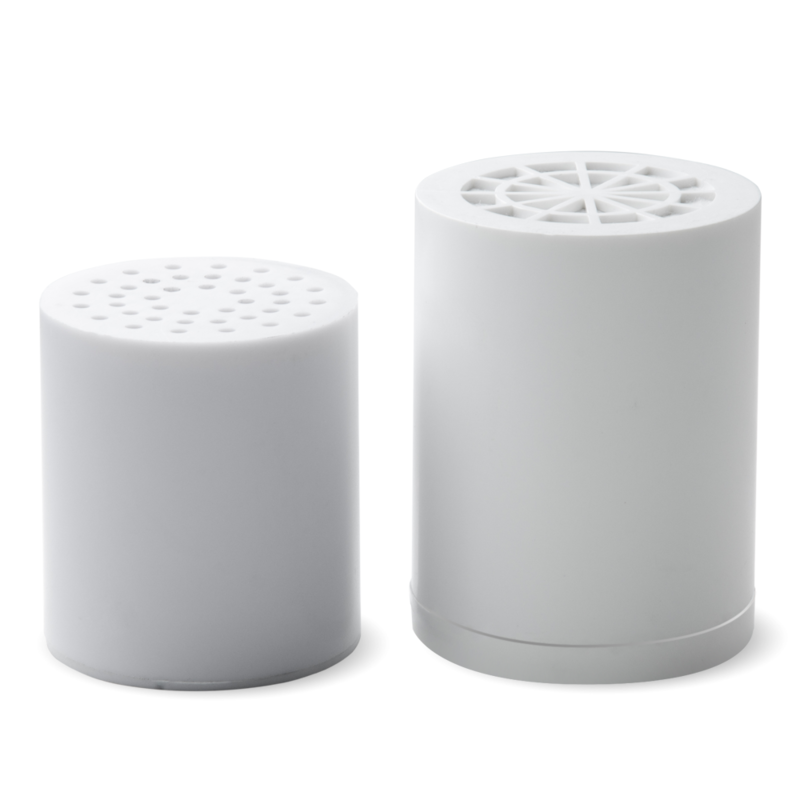 If you are looking to make your shower water healthier and cleaner at a reasonable cost, this filter is for you! KDF: Remove up to 99% of chlorine, hydrogen sulfide, microorganisms, scale and water-soluble heavy metals such as lead, mercury, and iron; kill bacteria and inhibit the growth of bacteria, algae, and fungi. Size: Diameter 3 IN. by 5 IN. What is KDF after all? KDF was shorthand for Kinetic Degradation Fluxion. Zinc and copper are the preferred metals used in the KDF alloy since both are good reducing agents regarding common inorganic contaminants. It effectively removes up to 99% of free chlorine, varying amounts of iron oxides, hydrogen sulfide and small amounts of lead and keeps the unit bacteriostatic. It is a toxic, inorganic chemical that kills bacteria and living organic matter, including epidermal (skin) cells and cells within the body. It is a bleaching agent that causes dry skin, brittle hair and has been linked to colon and bladder cancer. When vaporized in a hot shower or bath, it is also an irritant to the lungs and mucous membranes. The KDF media is an inhospitable host for E. Coli and Pseudomonas bacteria and will inhibit their growth within the filter. KDF keeps the unit bacteriostatic. In the presence of the KDF media and the minute electrical current it generates, small traces of lead and larger amounts of iron oxides literally remove themselves from the water by bonding with the copper and zinc compound, similar to electro-plating. Iron and sulfur readily bond to the media, so much so that if there is an excess of these two elements in the water, the life span of the filter will be slightly shorter, resulting in the need for more frequent cartridge replacements. Models include: HOC, SLC, A1-C, HHC-2, AQ-4125. As mentioned above, KDF performs excellently in all our Shower models at removing chlorine and becomes catalyzed in the presence of hot water. It is also a bacteriostatic filtration media that prevents the growth of bacteria and fungi. It also helps prevent bacterial growth in carbon filtration media when the two are combined. Activated carbon in our iSpring filter has long been known for its effectiveness at removing chlorine along with a wide spectrum of chemicals including VOCs (volatile organic compounds) including herbicides and pesticides, many of which are carcinogenic. Located in Alpharetta, Georgia for over a decade, iSpring Water Systems LLC is a family owned company specializing in water filtration systems. We aim to make high quality drinking water accessible for all households. 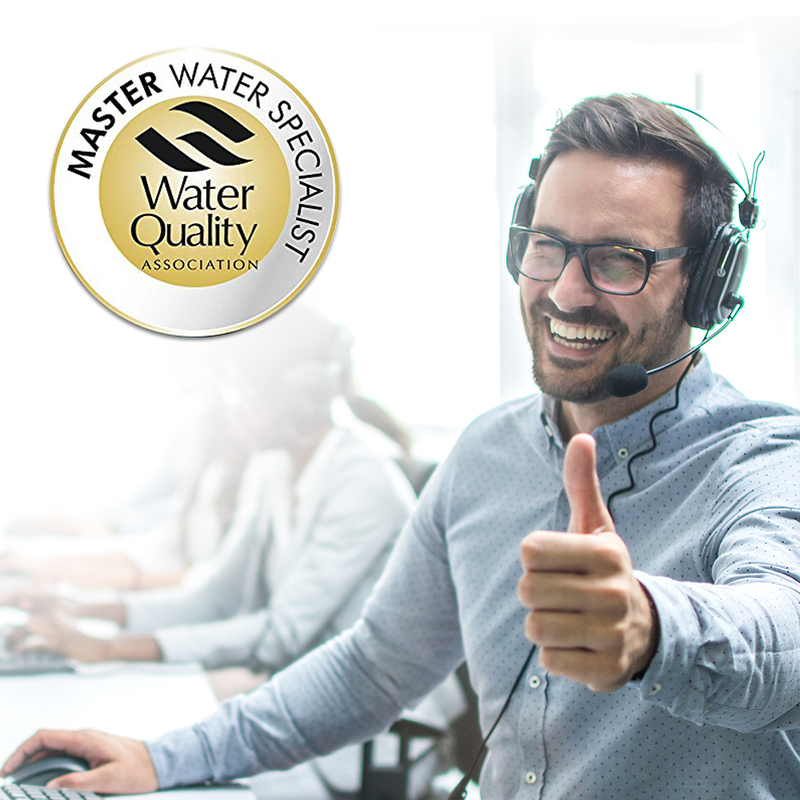 With affordable pricing, solid quality, prompt delivery, and top notch customer service, we hope to assist in bringing you great water for years to come. Such a great whole home filtration system! This system is very large, big enough to be used for a business. The filters last a long time as well." Have had the system for about six weeks; love it! Water tastes great - we are very happy with system. Have not run into any problems. Would recommend this systems highly!" The installation of the RO system is simple. We had an RO system before and the water with this new system taste better." Great filter - water takes great. Lab results were excellent. Valve on faucet leaked after a few months, iSpring immediately replaced under warranty, free of charge." System was easy to install following directions and fits under our small sink area perfectly. We've had it for several months now and there have been no leaks or issues with any of the components and the water still tastes excellent! Video shows our under-sink cabinet with the system installed." I needed a new RO system. My old system was over 7 years old, it was time for something better. I found the ispring had a 6stage RO system. I also looked at the cost & availability of replacement filters. I like the fact there are filter kits to buy, and are reasonably priced. ... The water from the new system has a nice taste. Overall, the system was well laced,easy to install & works great. I would buy this system again."